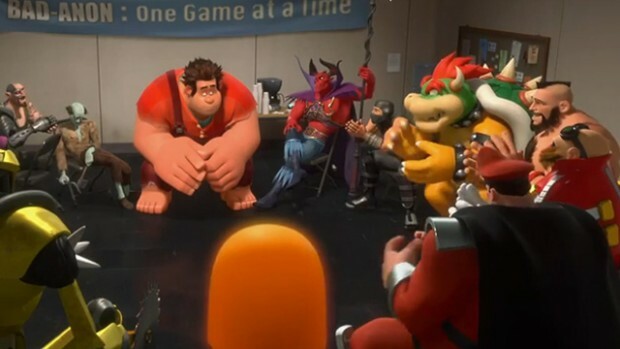 NGNT writers Edward and Amos both managed to watch Wreck-It Ralph, a movie about videogames that features cameos from a few popular videogame characters. How does the film fare? Is it another Scott Pilgrim or another King of Fighters? Since Edward watched the movie on his birthday, he’s decided to edit his review to appear first (sorry, Amos – Edward). Wreck-It Ralph joins Scott Pilgrim VS The World as one of the rare, original videogame movies that are actually good. While Scott Pilgrim focused on using loads of videogame references and a ludicrous setting to appeal to gaming nerds, Wreck-It Ralph opts for a more direct approach: it takes place in a videogame arcade, featuring videogame characters brought to life. You don’t have to be an arcade gamer to appreciate the fantastic opening moments of the movie. Much like the 3D animated series Reboot, we learn that the bits of programming code, the character sprites and 3D models inside our game machines, are real sentient beings programmed for one single purpose: to entertain us, the players. But the true stars of the show are the settings of the three main videogame “worlds”. The retroactive and blocky Fix-It Felix Jr is where the titular character resides, alongside his “nemesis” Felix who is no doubt a reference to Mario with his overalls and cap. The gritty, high-definition and polygonal world of Hero’s Duty, where female space marine Sergeant Calhoun (a nod to Mass Effect’s female Shepard perhaps?) wages a neverending war against a race of voracious mutating bugs (Halo, Warhammer 40K?). And finally, the cute and cartoony world of Sugar Rush where the film’s Mario Kart climax takes place, complete with over-the-top powerups and high-angle jumps. My mother and sister watched Wreck-It Ralph long before I did, and they both liked the show even though they were not gamers. Wreck-It Ralph succeeds because it aims to be a good movie first and foremost, with well-crafted and lovable characters, great animation and dialogue, and a story with a motif that is easily understood by both kids and adults. And if you happen to be a gamer, your viewing experience will be much more fun and enjoyable: can you spot and recognise all of the gaming references in the film? Hint: the game machines in the movie are real arcade titles from the 1970s and 1980s; also, stay after the credits and you should be able to spot the names of some very familiar videogame voice actors. A movie created by gamers, for both gamers and non-gamers. It’s hard to find fault with a film that can be enjoyed by everyone of all ages, and I see no reason why it won’t be crowned Best Animated Feature at this year’s Oscars. For years, video gamers have had to put up with poor video game movie adaptations (Street Fighter: Legend of Chun Li and Tekken, I am looking at you guys). These films would raise the hopes of the gaming community, but inevitably let us all down. Well my friends, I am extremely pleased to tell you that I have watched Wreck-It Ralph, and it does not disappoint. 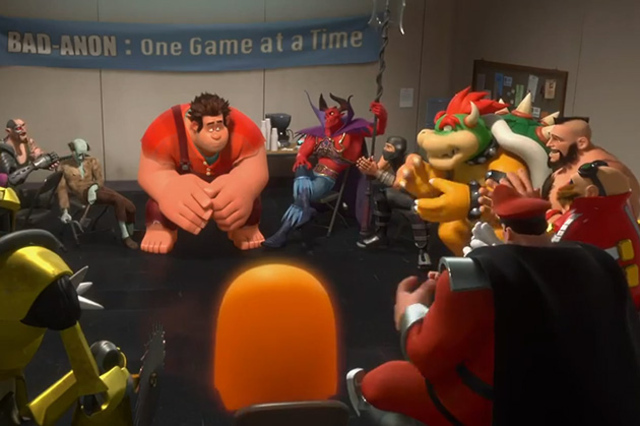 Wreck-It Ralph follows the story of Ralph, the “bad guy” of a video game in an arcade. After 30 years of being the villain of his game, he has grown tired of not being appreciated. In order to prove that he too can be a hero, Ralph sets off to earn a medal to prove his heroism. But when Ralph leaves his game, it sets off a series of events that jeopardises the whole arcade. The premise of Wreck-It-Ralph is wonderfully simple. No one ever cares about the feelings of the Sephiroths, Bowsers or even the random zombies you defeat in a videogame. And Wreck-It-Ralph presents a compelling case of “what if?”. What if video game bosses aren’t bad people? What if they hated their job? What if they had feelings too? It is this alternate viewpoint, a viewpoint that turns the tables on one that we are accustomed to in videogames, that makes Wreck-It-Ralph so enjoyable. The film is wonderfully paced and the different worlds in the film are also beautifully crafted, each reflecting the era the various games were released in. Along with wonderful voice acting by John C. Reilly and Sarah Silverman, who voice Ralph and the hyperactive Vanellope respectively, you won’ t feel bored for a second. Gamers will also have a ball of a time trying to spot all the easter eggs in the film. Besides the talking part Zangief gets, other titular videogame characters and icons also make an appearance. Kudos to Disney for managing to convince the videogame giants to use their properties in this film. It must have been a hell of a negotiation, knowing how cautious some of these developers are. But most importantly, Wreck-It Ralph has heart. Most videogame films fail because beneath the special effects and fight scenes, there is no soul. Disney, with all their years of storytelling expertise, deftly sidesteps this pitfall. At its core, Wreck-It Ralph is the story of a misunderstood soul trying to find his place in the world. It is hard to not to root for Ralph as he tries hard to shed his bad guy image during the 100-minute journey the film takes us through. The extremely relatable story makes it accessible to everyone (it is also the perfect way to introduce videogaming icons to your non-gaming better halves). Ralph may be a walking wrecking ball in the film. But he has proved that with good storytelling (and a little help from the industry’s most iconic characters), a videogame movie doesn’t have to be a wreck. The authors both watched the film at the cinema on separate dates, paying for their own tickets (about S$8.50 for weekday pricing).